April 11th is #lovemyschoolday! The hope of the social media campaign is that educators across the world will unite to leverage the positive power of social media to inform as well as inspire our school community and improve the culture of education. The event dates back to 2014 to Author and Superintendent John Wink’s (@johnWink90) blog post. Last year, the hashtag generated over 3,000 tweets and trended quickly. We want to create a school culture where teachers, students, and principals are empowered to share on social media the reasons that they love to work in their school. We want to “tell our story” and share the great learning that is taking place. 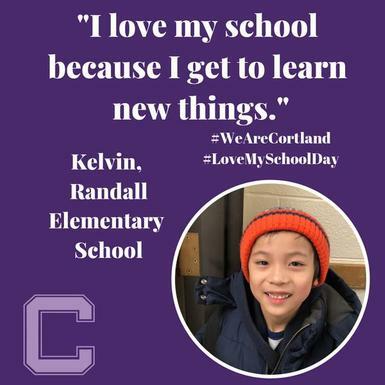 Please use the hashtag #LoveMySchoolDay in addition to #WeAreCortland if you are tweeting about what is going on in your classroom! Each district account will be sending out messages regarding the campaign as well. Make sure to check twitter for reasons why our students and staff love school today! To read more about #LoveMySchoolDay please click here.